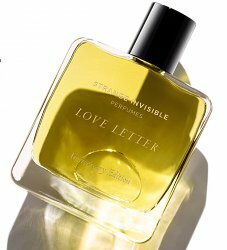 Indie natural brand Strange Invisible Perfumes has launched Love Letter, a new fragrance celebrating the brand's 15th anniversary. An ode to the art of botanical perfumery, Love Letter, is an affectionate composition of blue lotus, Hawaiian temple mandarin, Tahitian vanilla, Indian tuberose, frankincense, Moroccan cedar wood, and organic rose. To commemorate her company’s fifteen-year anniversary, founder of Strange Invisible Perfumes, Alexandra Balahoutis, chose the fifteen essences that have always made her swoon, some of which shall remain secret. Additional notes include bergamot and lavender. Strange Invisible Perfumes Love Letter is $425 for 50 ml Eau de Parfum. “Some of which shall remain secret.” Of all the nonsense in perfume marketing, fake mysteries may be the thing that makes me the grouchiest! Maybe if you pay the $425 she lets you in on the secret? Love the name of the perfume … Do NOT love the price. The SIP brand started out expensive and has gotten more so. But I do really love some of the perfumes. Agree with you on all the above in your reply. p.s. Wearing her zodiac perfume – CANCER as I type this. I love this one and wear it often. I have 3 from her line, Cancer, Pisces and older discontinued one – Tropical Vial. I wish I’d bought more when they were a bit cheaper! I have too many SIP perfumes to count, but I do wear them and wear them out. In some cases I’m on my 2nd or 3rd bottle. I love Tropical Vial, this was one of the great classic SIPs for me. The eye-bleeding prices are what they are, but this company takes quality, organic/botanical/their own distillation sources & all that jazz seriously. I just ordered a sample of Love Letter, we’ll see how it works out. Vanilla is usually a deal breaker for me, and the SIPs I did not care for – Magazine Street, Invisible etc were part of the vanilla base lot. Completely agree…the prices, in some ways, make more sense for this brand than for many others. And I respect that she does her own distillation. Still, I’m not willing to pay that much for a perfume. It would only make sense if they had virgin nuns and elves picking each of the materials they used on this perfume. For that price you can buy a bottle of a guerlain extrait which will be richer and better than this…. Not the same thing – apples and organic oranges. As someone who owns a few bottles of Guerlain extraits, including the current formulation of Mitsouko, I agree that pricewise it’s a fair comparison, but it depends what you are looking for. If you want the strength and lasting power of mixed-medium (naturals plus synthetic) perfumes, Guerlain offers some good choices, but for the purity, truly green quality and yes, artistry of all natural perfumes, SIP is hard to beat. Vote with your wallet, as you see fit! Akimon, i have entered on a journey to learn create scents and now i’m pretty sure that purity, quality and using 100% naturals still not justify the high price tag. It’s more a question of marketing indeed than quality. That’s why i’m pretty sure that they are overpriced. For quality, artistry in natural i think Profumo.it does it better without beeing greedy.